"Seymour is home of the 120th Rodeo and Cowboy Reunion.. 1000's of people will be in Seymour and will be ready to shop! We will have antiques, chippy wood, monogrammed items, western art and so much more! 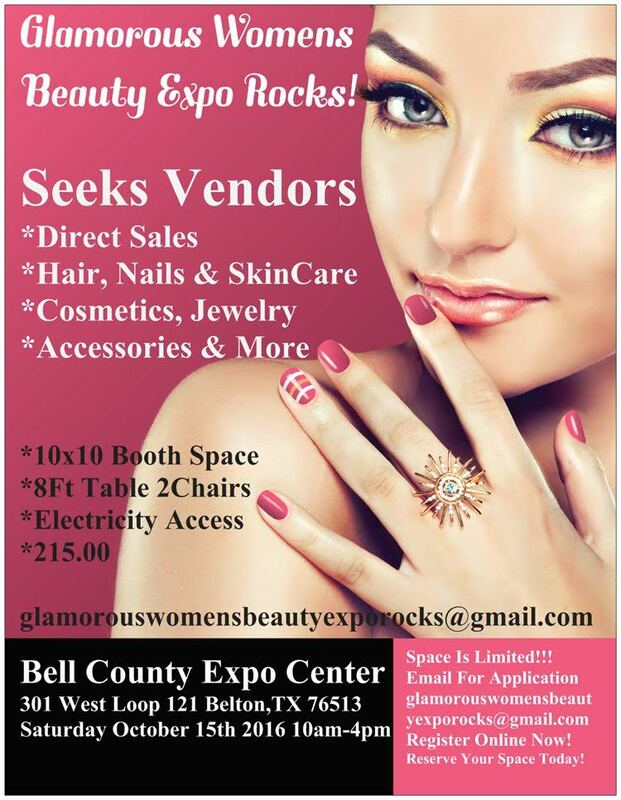 Seeking vendors!" Booths are 8 X 8 and cost $50. Applications are available here and are due by June 30th, 2016. For more information, visit their website or contact their event coordinator at Eventsbysweett@gmail.com / text or call 254-258-9867. "This event is a great opportunity to shop early for Christmas, find that special gift for someone, or just enjoy shopping for you. The men of the church will have Mimosa Cafe open for lunch. Plus a delicious Bake Sale! 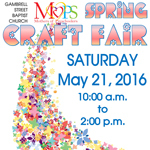 Our vendors will be selling jewelry, crochet items, quilts, home decor, homemade items, canned fruits, and much more! Last year over 70 vendors participated with an attendance of over 500." Booths are 10 x 6 and the fee is $30. 8 ft tables are available for $10. Electricity outlet is $5. This fee includes 2 chairs per space and coffee to vendors prior to 9:00AM. "Granbury, Texas will kick off summer this Memorial Day Weekend in style, 50s style that is! The Historic Granbury Merchants Association presents Cruisin’ Granbury, a festival dedicated to the era of cool cars and rock and roll. On May 28-30, visitors will enjoy dancing, lots of vendors, hot rods, and yes, even an Elvis tribute competition Saturday and finals on Sunday! 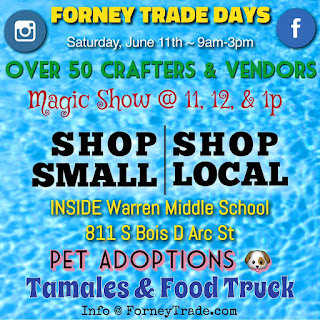 Art/Craft Vendors, Food, Entertainment on the Main Stage all 3 days." "Got Junk collecting Dust? Treasures no longer treasured? Don't want to plan a garage sale? Come and see what is for sale. We still have a few spaces available if you would like to sell your goods." "Come check out the show!" 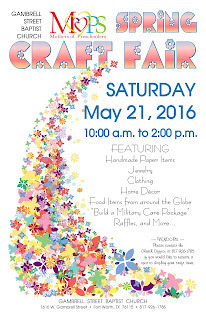 "Come check out the 50+ crafters and vendors we have INSIDE! Unique hand made items, home decor, rustic style, boutiques, health and beauty, jewelry, candles and home fragrance, and so many others! And you will want to check out our new magic show, held on the hour between 11a and 1p. 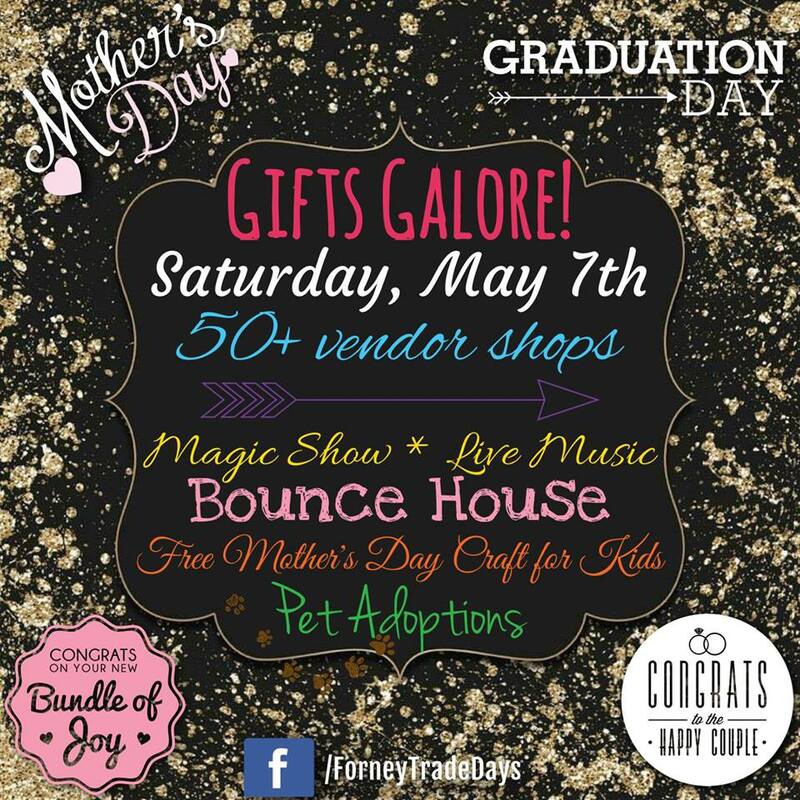 We will also have Live music, hot tamales, food truck, pet adoptions, and more! 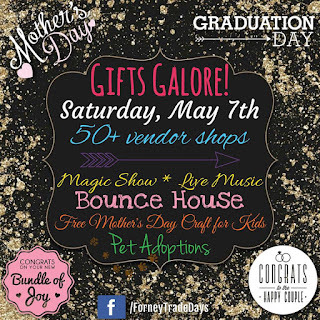 Stop by to see the fun for yourself!" 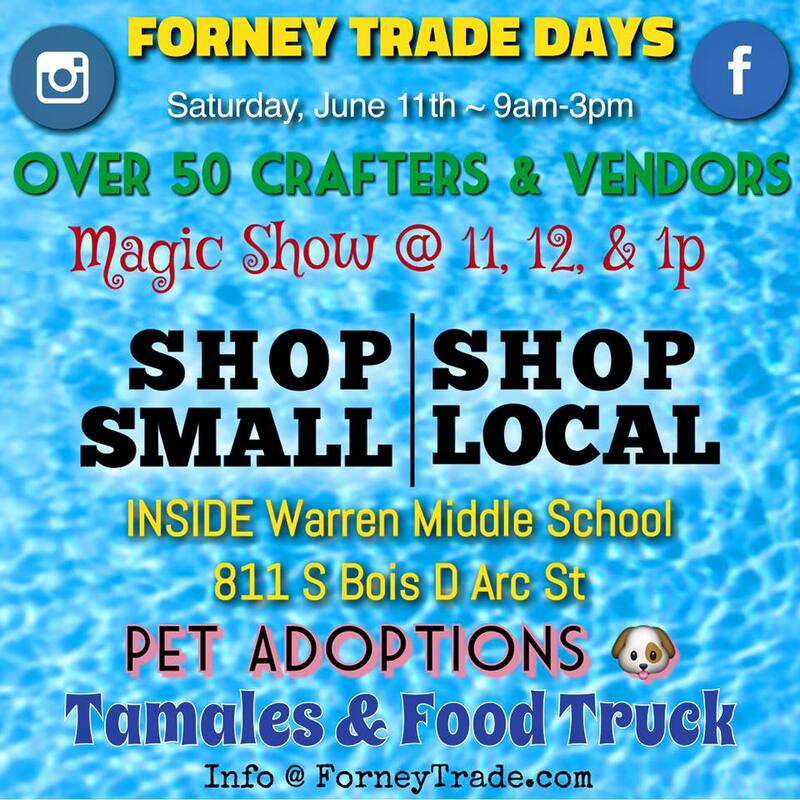 "HUGE arts and craft expo -- there will be home made and handcrafted item from jewelry to woodworks from homemade kettle corn to handmade home decor Swag bags for the first 50 guest of the day that purchase 10 raffle tickets to our drawing. 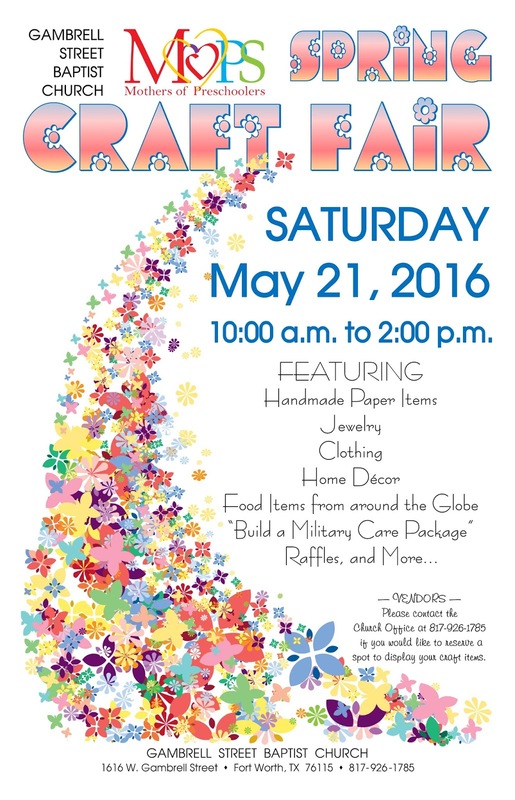 There will be drawings, raffles and an auction throughout the day, Door prizes, fun, food and custom arts and crafts! Admissions is $5 per person or $3 and 2 canned goods for our local food banks. Parking is $3+. Kids 12 and under are free with paid adult." Booths are 8 X 8 and cost $125. This includes 1 6ft table and 2 chairs and entry in our vendors only drawings. Additional tables are $8 each. Applications are available here and are due by June 17th, 2016. For more information, contact their event coordinator at Ccbusby01@gmail.com / 817-770-6971 (please detailed voicemail with contact info). Booths are 10 X 16 ft, $15 for one space, $25 for two spaces. For more information, contact their event coordinator at dmuhling@garlandtx.gov / Ginger (205) 205-2887. "Hogs for Hope is Raising Money for the Hope Center of Fort Worth. Which deals with Autism." Applications are available here are due by July 01, 2016. 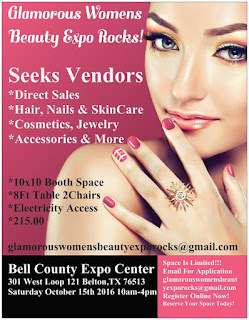 For more information, visit their website or contact their event coordinator at ATexasGirlBlogs@gmail.com. Please sent an email to confirm availability. "JPIIHS Christmas bazaar in Plano, TX hosting 100+ vendors with items including holiday decorations, women's clothing and jewelry, home decor, children's toys and clothing, beauty products, food gifts, and MORE!" Applications are available here and are due by October 19, 2016. Double booths may be requested for twice the list prices above. This fee includes a very well stocked hospitality suite. Vendors rave about how well taken care of they are. Lunches are available for purchase and will be delivered to your booth. Tables and chairs are not provided and should be brought by vendors. Applications are available here and are due by June 17, 2016. A late fee of $25 applies after this date. For more information, visit their website or contact their event coordinator at marketinthemeadow@yahoo.com / 214-394-6693. Booths are an 8' table for $35. This fee includes 2 chairs, coffee service and water all day. Electricity available upon request. Applications are available here (with Vendor Letter) and are due by May 9th, 2016 (extended). For more information, contact their event coordinator at sfrankiewich@hotmail.com / 817-926-1785.